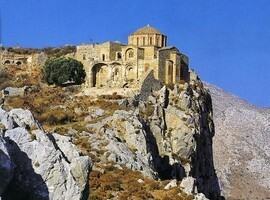 The name is a compound word derived from the two Greek words Moni (Single) and Emvasis (Entrance). 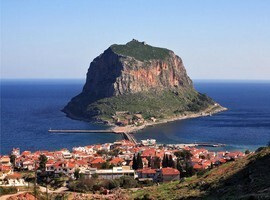 Monemvasia’s nickname is “Gibraltar of the East” because it happens to be out identical to the rock of Gibraltar. 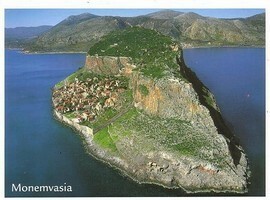 In Monemvasia the unique landforms of the rock coexist along with human fortifications. 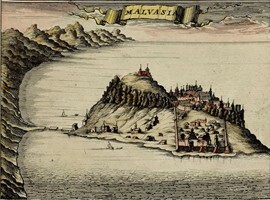 As a floating fortress, it is located right at the route of the trade between East and West. 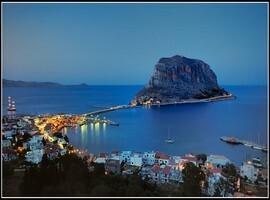 Its names are as many as its masters: Monemvasia, Malvasia, Malvazoui, Little Rock and Gibraltar. 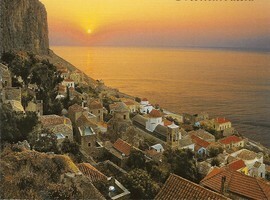 In ancient times it was called “Accra Minoa” as described by Pausanias, and it used to join the land at great length. 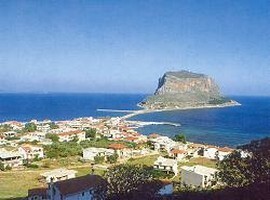 At 375 AD it was cut off from the mainland, after a terrible earthquake, and took the form we see today, just as happened with Elafonissos at the south. 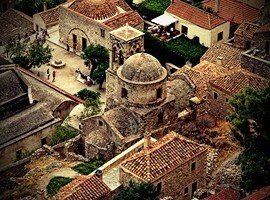 During the middle Ages it was occupied, barricaded and it flourished. 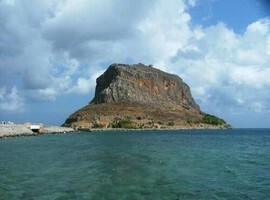 Surrounded by pirates and pirate bases, the residents of Monemvasia could not have survived without the protection of the rock. 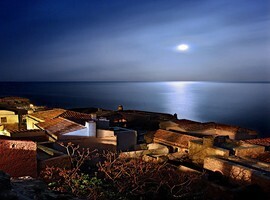 The human walled “lower city”: It is built beside the sea, on the southeast side of the Rock, with perfectly preserved and restored. 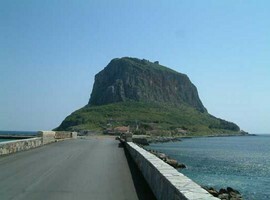 Many roads are narrow and only suitable for pedestrians. You can stroll through the square with a Cannon on its center. 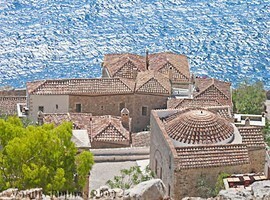 You can also visit the Archaeological Museum of Monemvasia, housed in a former mosque, a restored 16th century building. 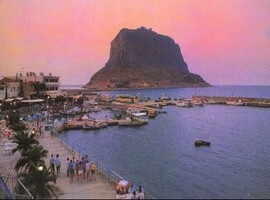 On the main street you will find many small charming shops, cafes and restaurants. 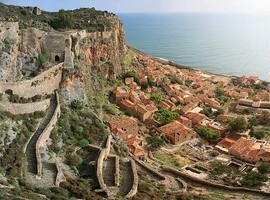 The “Upper City”: It is built on top of the cliff, and overlooks from above the Myrtoo Sea. 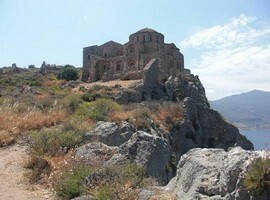 It is an impregnable natural fortress, with several ruins and few buildings to survive until today. 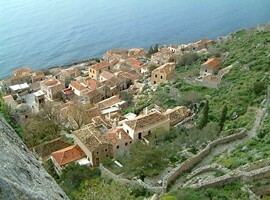 The climbing starts from the bustling “lower city”. 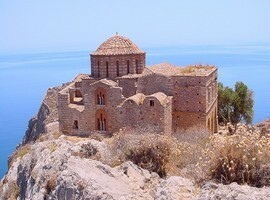 Of the 40 Byzantine churches with great architectural and historical interest, which are scattered in Monemvasia, here stands the most important of all. 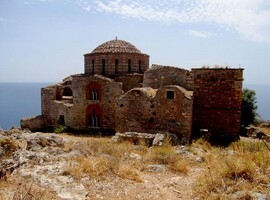 On the eastern edge, the steepest section of the cliff, stands the church of Hagia Sophia – built around the 1200 AD -, a miniature of the original church of Constantinople. 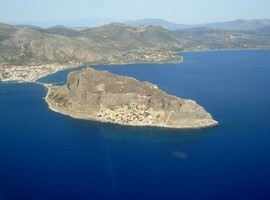 In recent years, the settlement “Bridge” was created, which took its name from the bridge that was connecting the Rock and the rest of the Peloponnese. 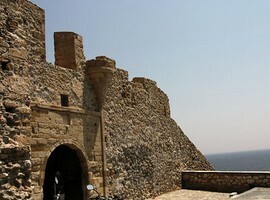 The bridge is now made by stone and has replaced the old fortification which was a wooden bridge, deployed by catapult. 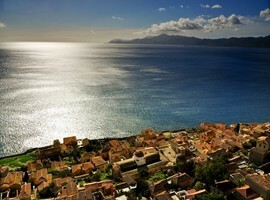 Here, you can also find several hotels, restaurants and entertainment centers.